When I walked into the Corners Gallery last October I had no idea that the owner would turn out to be related to an artist who had made a vivid impression on me on a visit to Ithaca eight years before, a long time to remember an image with no information other than a dry wall text. A single watercolor drawing, the untitled one at left, had been included in an exhibition of prints and drawings Shared Experience at the museum at Cornell University in November, 2008. The charm of this romantic figure resides in her specificity as much or more than in her self-consciousness and introspection. How the horizontal movement of the scarf softens the otherwise relentlessness of the multiple verticals. The charm of both drawings and watercolors is their customary intimate scale. They are suited to domestic spaces and invite the viewer to live comfortably with them at length. The gigantism of many recent paintings renders them more suitable to public spaces; how to relate to something that pushes the viewer away, maybe even out the door, makes them arrogant companions. During the intervening years I made occasional efforts to learn about Brenda Bullion (1939-1992) to no avail. Her early death and the undervaluation of drawing and watercolor when Bullion was working were woven into the scrim obscuring her work. Ariel Bullion Eklund, the gallery owner, is the daughter of Brenda Bullion. 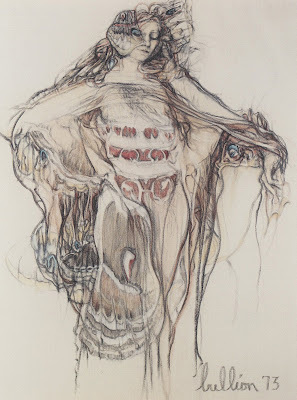 Image: Brenda Bullion - untitled, 1973, crayon and watercolor, Steven Barbash Collection, Herbert F. Johnson Museu, Ithaca, NY. As you can see, these are very old photographs. If the little blonde girl with the Mary Jane shoes sitting at the left end of the front row is four years old then the date is 1920. Her name is June Williams and she was my mother. She was named for June Tolliver, the heroine of a Broadway play that my grandparents saw at the New Amsterdam Theater on West 42nd Street. The Trail of the Lonesome Pine had been adapted from the wildly successful novel (1908) of the same name by John Fox, Jr. Florence Williams, or Billie as she was affectionately known, decided that if she ever had a daughter, June would be her name, and so it was. 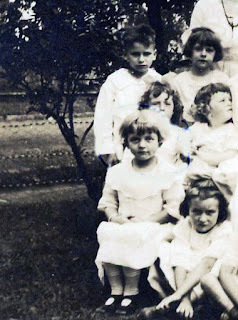 Florence is the woman standing at the left end of the back row in this picture. 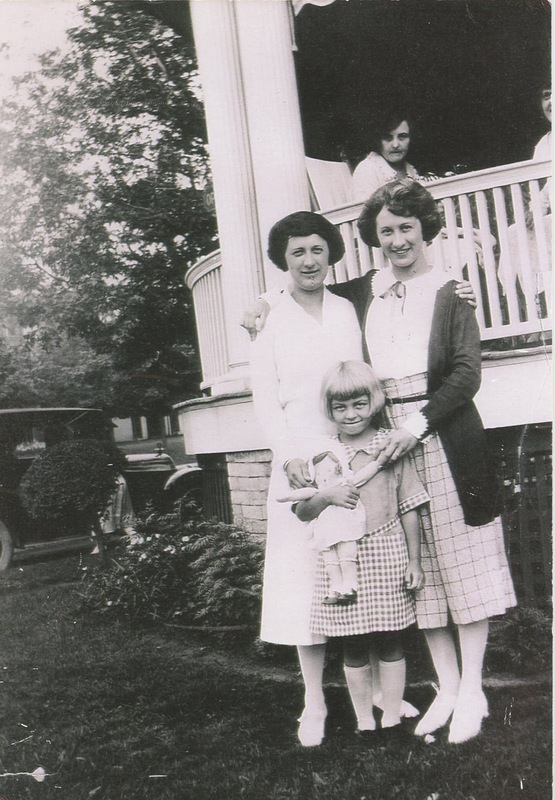 Billie was an apt nickname for this woman, I think, although she died before I was born so I never think of her as my grandmother; she had her own kind of insouciance and her daughter adored her for that. She knew what forms of birth control could be found in the city, she liked to make gin in the family bathtub during Prohibition, and she sent Norman, her husband, scrambling around a movie theater to search for bugle beads when one of her sheath dresses popped a thread. Her friend Kay married a wealthy bootlegger named Ray from the north shore of Long Island, a location that allowed rum runners to ply their trade with relative impunity and lots of nice chateaux to be had, especially after the movie industry migrated to Los Angeles. The tennis courts in the background were part of the summer home at Lake Success, in the Town of Great Neck. The name Lake Success is not a descriptor as I once imagined; it is a corruption of the name Sukut, taken from the Lenape Indians along with their land by people like my ancestors. There are no men in this picture because they were back in the city working during the week while the women and children enjoyed a respite from the heat, a custom of the time before air conditioning among the fortunate classes. Speaking of whom, William K. Vanderbilt purchased the land around Lake Success in 1902 for a summer home for himself and his new bride. Vanderbilt was an enthusiastic yachtsman but by 1904 he had become smitten with anything motorized, be it bicycle, motorcycle, or racing cars, and he set a land speed record at Daytona Beach. He infuriated his Island neighbors with his noisy drag racing ways. One of my mother's uncles was killed in an automobile accident; newly married in 1904, he was thrown from a car he was driving on Christmas Eve of 1905 and hit his head on the curb. Such accidents were not yet common when most people didn't have cars; his bride Rose never got over the shock. To put this in the perspective of that time, by 1908, there were still no more than 200,000 automobiles in the entire United States. 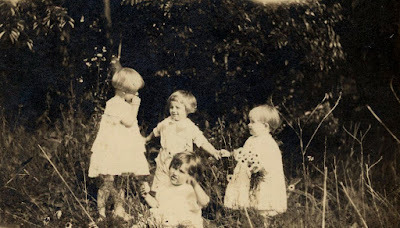 Something about the children in this next photograph has always reminded me of John Singer Sargent's painting Carnation, Lily, Lily, Rose. Yes there are four children here and only two in Sargent's painting but for me the two children, June at right holding a bouquet of wild flowers and her cousin Ruth at the left, a year older and taller are the story in this picture. 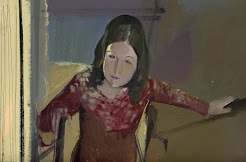 Both girls would narrowly escape death from thyroid cancer as adolescents and their relationship was so close that Ruth, who died first, was the last person my mother called for on her own deathbed. 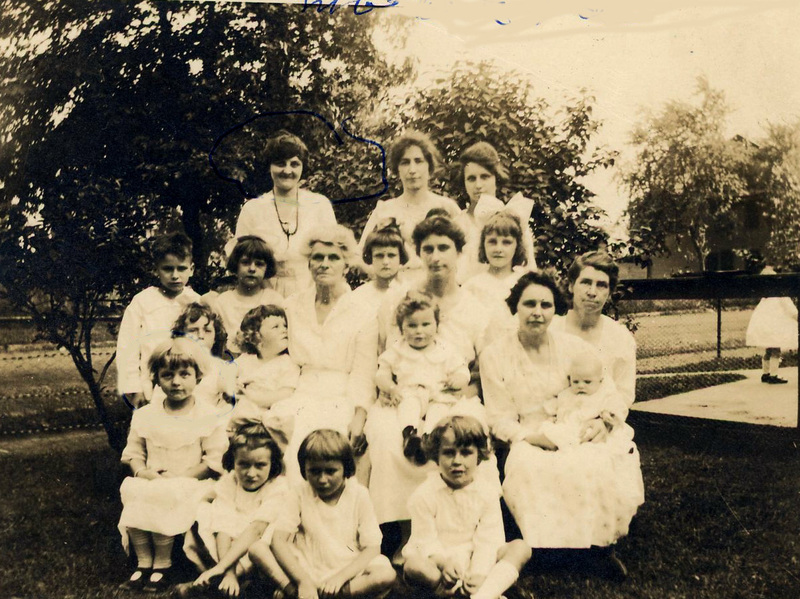 This early summer day must have meant something special to the girls; all the photographs taken that day are precisely dated Tuesday, June 28, 1919. Although this last picture is not dated, on the visual evidence June appears to be about eight years old. This was taken at home in West Orange, New Jersey, in the house built by Norman for his family, and these are Billie's sisters, Lottie and Lillie posing with their niece. Lillie was the caboose baby of the family and the story is rather sad and typical for its time. After begetting two daughters, their father deserted the family for eleven years, indulging his wanderlust for sailing around the world, while knowing that his wife and children would have to return to her parents' home for support. When he reappeared, they made her take him back and there are no photographs ever after that show a smile on her face, and yet Lillie was, by all accounts, a delightful person and her niece's favorite. June was nicknamed Chick for her yellow hair; I still have an envelope of it and after all this time the hair still glows like spun gold thread. As for me, I still hope to learn someday what kind of touring car that is parked in the driveway. Images: from the author's personal collection. the stub-root aching in its oil. That is one tumescent flowering artichoke, you may be thinking after reading this poem by Robin Robertson. I thought of furniture, specifically the old custom of decorating the four posters of a bed with finials shaped like artichokes, as a symbol of hope. 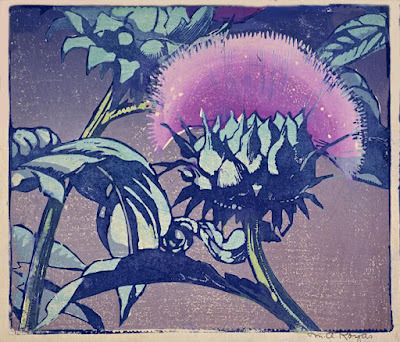 What makes the pairing of this poem and that woodblock print uncanny is that both Robertson and the artist Mabel Allington Royds share Scottish roots; Robertson was born there and Royds moved there to teach at the Edinburgh College of Art. It turns out that Robin Robertson is far from the first person to connect the artichoke with male potency. In the 16th century, for a woman to east an artichoke was scandalous; this aphrodisiac thistle was reserved for men. It was Catherine de Medici who married King Henry II of France at the age of fourteen in 1533 who announced a change in mores: " If one of us had eaten artichokes, we would have been pointed out on the street. Today young women are more forward than pages at court." And if you decide to enjoy an artichoke, why not prepare it as the ancient Romans did, with a combination of honey, vinegar, and cumin. Mabel Allington Royds (1874-1941) - Artichoke, 1935, National Galleries of Scotland, Edinburgh.